As a director, Edgar Wright has not done a bad movie yet. This is going back to 2004’s sleeper “Shaun of the Dead,” which poked fun at and referred to zombie legends dos and donts. Now, with “Baby Driver,” Wright takes on the action genre he knows all too well with 2007’s “Hot Fuzz,” a cops and robbers tale that made fun of life in the idyllic countryside. Simon Pegg was an overenthusiastic cop who excelled at most things, just not personal relationships. 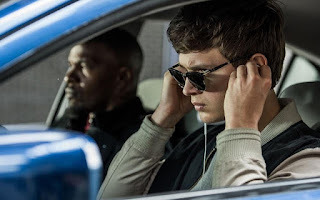 In “Baby Driver,” Ansel Elgort (“The Fault on Our Stars”) is Baby, a getaway driver who listens to music as a means to coping with a tragedy that claimed the life of his mother many a year ago. His boss is Doc (Kevin Spacey, “American Beauty,” “The Usual Suspects”), who he deals with as a close friend and confidant. Baby does not directly participate in the wrongdoings, since he is essentially just the ace behind the wheel and an awesome getaway driver. Baby’s life includes taking care of a deaf caregiver, Joseph (CJ Jones) who he interacts with on an almost daily basis. When having his peanut butter on his sandwich, he prefers to have the whole piece of bread completely covered in the peanut butter, all to the edges. Life gets more complicated when he meets Debra (Lilly James, “2015’s Cinderella,” “Pride + Prejudice + Zombies”), a waitress at the local diner, a place he has frequented since he was a little kid. The team Baby works with usually switches, but he has been around the married couple of Jon Hamm’s Buddy and Elisa Gonzalez’s Darling. Making a brief spell is Jon Bernthal’s Griff, who adds nothing on interest to the proceedings. New in the nix is Jamie Foxx’s Bats, a thug who would rather kill the clerk than just pay for a pack of gum. Spacey finds a way back in Baby’s life, by fitting in another job involving a bank they cased earlier in the movie. Baby even brings in Spacey’s nephew who also knows the ins and outs of accessing the situation. The pacing on this entire movie feels brisk and efficient, like it knows where it is going every step of the way. Like his work in 2010’s “Scott Pilgrim vs. The World,” music plays an important part of the proceedings. It is used not just as a placeholder, but rather as a way to enjoy the events as they are occurring. I would count this one as a summer sleeper surprise, because it knows what it is doing every single step of the way. Sure, it is violent in spots, but when flicks are tuned down to placate themselves for a PG-13 audience, it is refreshing to see a filmmaker go all lout to earn that “R” rating with pride.